The Gang Gang Cockatoo of Australia is a lovely aviary bird. If you have the space to keep them, these beautiful Cockatoos are a source of constant delight. 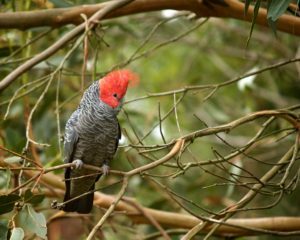 In the wild, Gang Gang Cockatoos live in the forest canopy and are quite acrobatic fliers! They are not shy around humans and will eat and drink on the ground quite near to you. 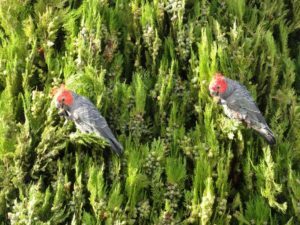 They live in flocks of up to 60 birds but pair off for the breeding season. Gang Gangs are migratory birds and spend summer in mountain forests and winter in valleys or low altitude forests. Their voice is described as the sound a cork makes when leaving a wine bottle, without the pop at the end, of course! Gang Gang Cockatoos eat seeds, fruit, berries, greenery and nuts in addition to the occasional insect in the wild. In captivity, their diet should be similar, with a basic small seed mix and plenty of fresh fruits and vegetables. Oats may be added to help with body heat during the winter. Gang Gang Cockatoos also enjoy nuts, corn and dog biscuits or wheat bread. Grit should be supplied on the floor of the aviary along with fresh water. Try to construct a tall or suspended aviary, since Gang Gang Cockatoos in the wild only alight on the ground to drink. Your Gang Gangs need plenty of room to spread their wings and even better, to fly! They love chewing on branches, and Stringy Bark Eucalyptus trees are a particular favorite. Hawthorne branches with the berries on them are another treat for your Gang Gang Cockatoo. 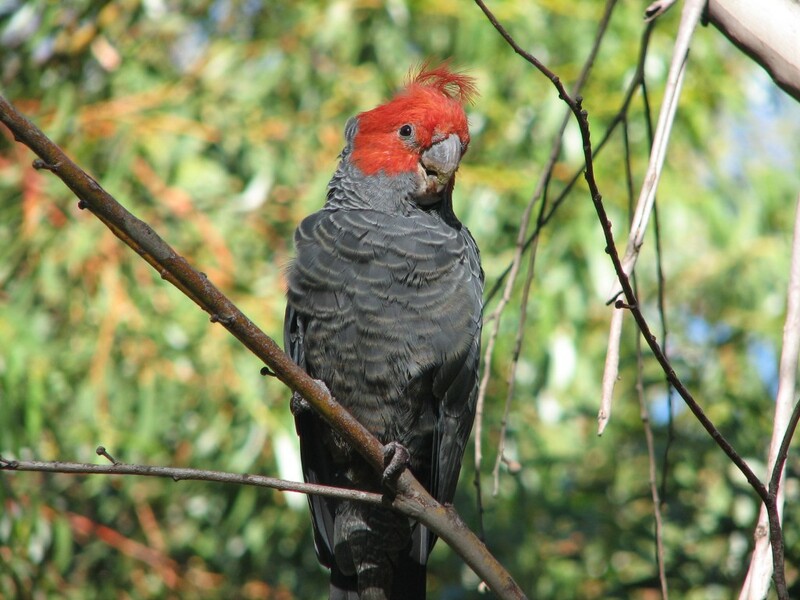 At maturity, a Gang Gang Cockatoo is about 35 centimeters long. Their bodies are predominantly gray, with a small forward-curving crest of wispy feathers. Males have striking red heads and crests in contrast to the gray females. The feathers on Gang Gang Cockatoos have pale white-gray edges. They have horn colored bills, gray periopthalmic rings, brown irises and gray feet. Often the feathers of the lower abdomen and under tail coverts have edges, which are yellow orange. 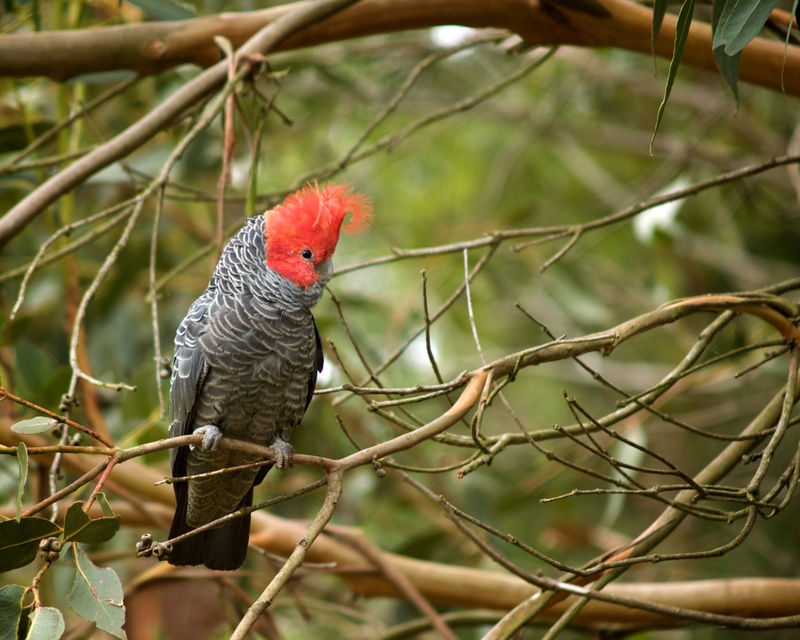 Male Gang Gang Cockatoos often have pale green webbing on their outer primaries. They weigh slightly more than females. Gang Gang Cockatoos are native to southeastern Australia where they migrate between altitudes depending on the season. They are also found in suburban parks and gardens on occasion. Gang Gang Cockatoos have been introduced to Kangaroo Island and sometimes visit Tasmania. Gang Gang Cockatoos were first recognized by Grant in 1803. They are alternately known as Helmeted Cockatoos, Red-Crowned Cockatoos, Red-Headed Cockatoos, Red-headed Parrots or Red-crowned Parrots. Gang Gang Cockatoos are particularly prone to boredom related disorders. This can be alleviated by keeping them in pairs or small groups, offering them smaller seeds, and making sure they have plenty of wood to chew on and lots of exercise. When bored, Gang Gang Cockatoos pluck their feathers or their mates’ feathers. Their aviaries should be about five and a half meters long, one point two meters wide, and as tall as possible. Gang Gang Cockatoos in the wild breed from October to January in private eucalyptus tree hollows. They lay two to three matte elliptical eggs, which incubate for about a month. Both parents will sit on the eggs. Gang Gang Cockatoos fledge at about eight weeks, but parents continue to feed them for about five more weeks. In captivity, Gang Gang Cockatoos need a private nesting box or hollow log. Around breeding season, they will begin to eat other birds’ eggs off the aviary floor! Immature Gang Gang Cockatoos have lots of red tingeing to the feathers on their undersides. They have grayish-white or-yellow barring over the tail. 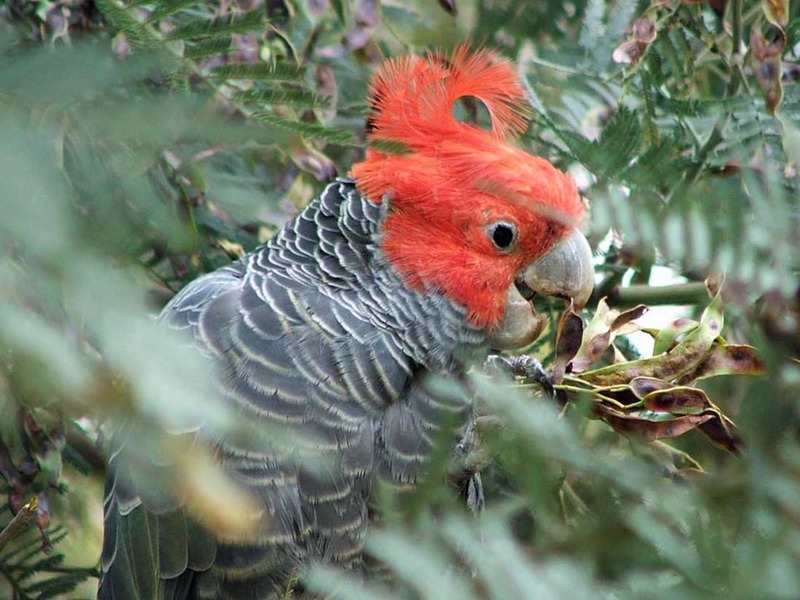 Young males do show a lot of red over their crowns, heads and necks.